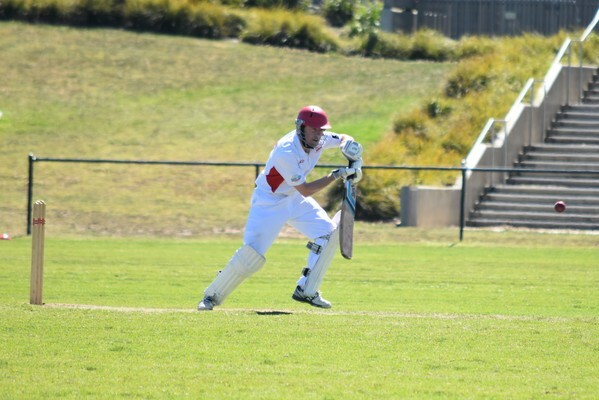 Star batting pair Paul Jubber and Matt Caulfield helped Ocean Grove into a commanding position at stumps against Drysdale on Saturday. Playing coach Paul Jubber (113) scored his third hundred for the Grubbers, while new recruit Caulfield belted four sixes and nine boundaries in his innings of 95. Ocean Grove was all out for 264 from 71.1 overs on day one of the round six two-day clash. Drysdale seized control of the match early on its home deck to have Ocean Grove in deep trouble at 5/71. It was carnage at one stage the visitors were reeling at 4/36 with its top order of Huon Bertino (3), Mick Thornton (4), Andre Scholtz (9) Michael Kenneady (0) all out in quick succession. Jubber who hit 16 boundaries and one six, then combined in a 160-run fifth wicket partnership with Caulfield. Jubber conceded the Grubbers had a fight on their hands to resurrect their innings after a poor start. “Our backs were against the wall and he (Caulfield) was very determined and was up for the contest – so really pleased for him to make an impact as he has with both bat and ball,” Jubber told the Voice. Jubber praised the Drysdale bowlers including new ball opener Blake Robinson, who took 3/46 from 17 overs. “They played pretty well early doors. 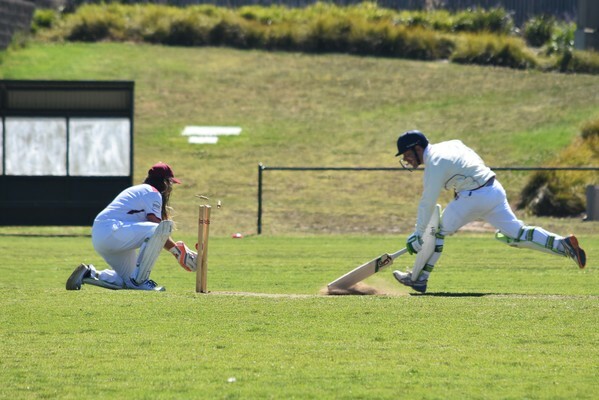 Drysdale Cricket Club coach Shane Cutajar said it was a tough way to end the day after the bottom-placed Hawks struck with four early wickets for the second time in three weeks. “It is two (games) in a row we have taken four really early vital wickets against two really good batting sides,” Cutajar said. Hawk bowler Troy Jones (3/61) also finished with a three-wicket haul from his 19 overs, while Luke Malcolm (2/58) picked up two scalps. The Hawks require 265 for victory this Saturday. 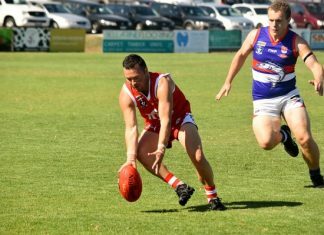 OCEAN Grove A1 suffered its first loss of the season on 11 November going down to reigning A Grade premier Anglesea at Ray Menzies Memorial Oval. The Grubbers are still at the top of the A1 ladder with a 4-1 record after five rounds. 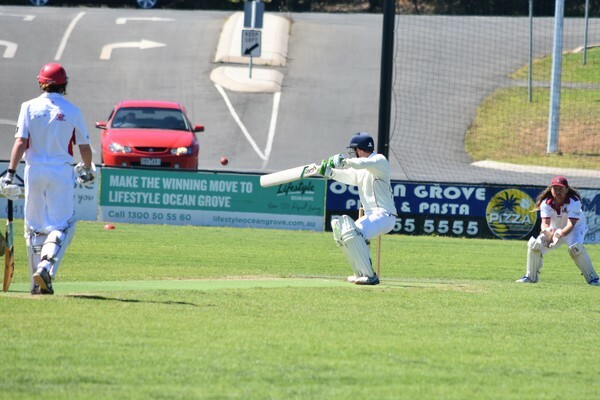 LINDON Giuffrida cashed in with the bat to score his first ever hundred as Ocean Grove A2 compiled a strong first innings total against Newcomb on day one of its two-day game at Ray Menzies Memorial Oval. Giuffrida, an A1 bowler relegated to A2 at the expense of Billy Foord Englesman who made his A1 debut after his A2 seven-wicket haul on 11 November, smashed 11 boundaries in a blistering knock of 103. The Grubbers won the toss and batted first, finishing on 7/249 from 75 overs. Jubber said he was pleased for Giuffrida who showcased his all-round talents after being dropped from A1. “We were really pleased for Lindo, we’re delighted he has scored his first hundred for the club,” Jubber said. Giuffrida shared in an 87-run fourth wicket partnership stand with youngster Fletcher Long (53) who scored a timely half-century. OCEAN Grove B2 requires 278 runs for victory against Jan Juc when its two-day clash resumes this Saturday at Bellbrae Reserve. Batting first the Sharks compiled 9/277 from 60 overs. Grubbers bowlers Marcus Wirth (2/28), Tahj Wirth (2/52) and Matthew Stanic (2/53) all took two wickets apiece. The Jan Juc trio of Gerard Cook (50) Dennis Bilston (51) and Cole Fox (50 not out) all scored half centuries. A crucial unbeaten knock of 85 not out from Greg Scarpa helped Ocean Grove D Grade score a 65-run victory in its one-day clash against Wallington. Batting first at Ocean Grove Memorial Recreation Reserve the Grubbers piled on the runs to finish at 3/217 from 40 overs. Tyler Carmody was unbeaten on 50, while Zack Carmody was 44 not out. In reply Wallington was all out for 152 from 37.1 overs.